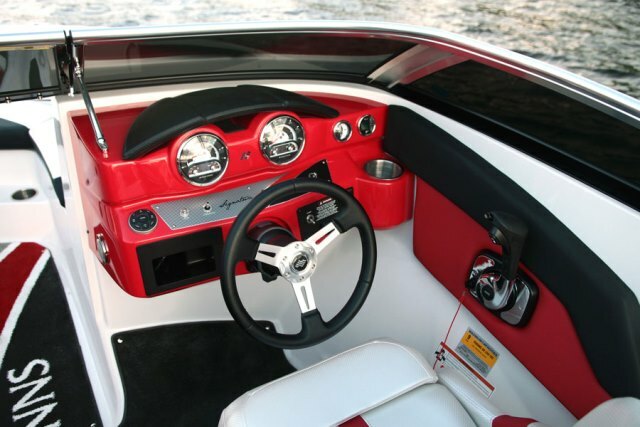 This boat trim features red, black and white colors with a background carbon fiber finish and bright aluminum graphics. Choosing red as an accent color aligns with some of the more popular classic car models, including the Corvette, Mustang Shelby GT and Chevrolet Bel Air. A unique approach to creating a carbon fiber pattern on aluminum is to adapt the look of the finish so it compliments carbon fiber but is not an attempt to duplicate the material. The wide variety and sizes of weaves are just the starting point in this exploration. Customization in color, scale and structure is possible.